English at Sandvika: Edward Scissor-hand! Edward Scissor-hand is a beautiful movie about one boy that has scissors instead of his hands. His father had a factory and he had a dream of making a real human from one of his robots, and that's what he did, he made Edward. They lived in big castle away from other human beings. One day his father died and he had to live alone in this big castle without any contact with other people.The story is about how he is dealing with meeting a new society and how challenging it was. For me it was pretty similar when I came to Norway. It was a bit challenging in the beggining, but now I cant even imagine living in other country than Norway. Edward Scissor-hand is really a beautiful story about relations between people. It helps people understand that you don't have to be just like others to make them like you. If you see this movie you will also understand the power of love. You are able to do anything for this special person you are in love with. This scene is taken from the movie when Edward is giving a hug for the first time to Kim,the girl he is in love with...What a romantic moment. Enough for this time.. It is only 6 days till Christmas Eve and I can't wait! I wish everybody a Merry Christmas and a Happy New Year! Beautiful comment about the movie! Yes it is a great movie, I agree! Love your picture as well. 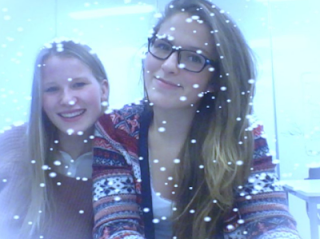 Looks like it is snowing in our classroom!